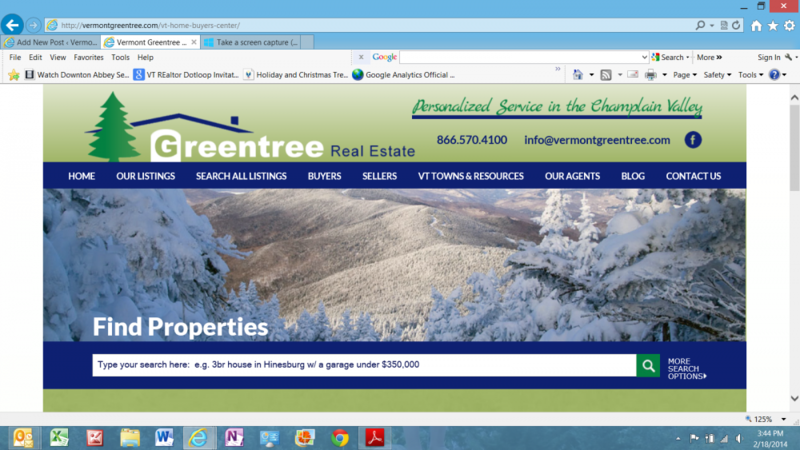 We just completed a new design of our website, www.vermontgreentree.com and are so excited to share it with you. We've been a client of Union Street Media for many years and enjoyed the process of updating some elements. Many clients have told us that they truly use and enjoy the content on our site, but as with all technology, we felt that the overall design could be "refreshed" as they say to make the site lookcleaner and easier to use for our clients. Please let us know what you think! We love the new look, the multitude of search options,and how easilyaccessible the new design comes across. For example, if you're just doing a quick targeted search, you can now use the new google search bar option on the top of every screen where it says "Find Properties". Or if you are starting to do research for a spring or summer purchase, we recommend creating a free account where you can save searches, make comments and even setup appointments to view homes. You can do this under the "Simply and Save Time" feature on the top left of any page. As always, we value your feedback and look forward to hearing your thoughts! YES - Clean the Dryer Lint! Yes, this is a pile of dryer lint, and yes, it can cause a house fire. I'm writing about dryer lint because my dryer was broken and we just had it serviced on Friday. I thought my dryer, the venting, and the overall system was "clean" because I had actually had it serviced just three years ago. Guess what, the technician pulled out three times the lint seen in this picture from around my dryer drum AND within the vents going to the exterior of our home.So note to everyone - If you have not taken apart your dryer and had all the vents cleaned recently, as in the past year, DO IT! If you don't believe me, listen to Consumer Reports. Here are some tips they provide on keeping your dryer unit clean and reducing the risk of dryer lint fires, which are real. Use metal dryer ducts to help prevent dryer fires. Consumer Reports says that flexible dryer ducts made of foil or plastic are the most problematic because they can sag and let lint build upat low points. Ridges can also trap lint. Metal ducts, either flexible or solid, are far safer because they don't sag, so lint is less likely to build up. In addition, if a fire does start, a metal duct is more likely to contain it. Seetheir dryer venting safety report for more tips as well as photos and a dryer-venting video. No matter which kind of duct you have, you should clean it regularly. In addition, remove the visible lint from the lint screen each time you use your dryer (this is the easy one!). This not only will reduce the risk of a fire, but your clothes will dry faster and your dryerwill use less energy. If dryer film is a worry, there is certainly no harm in occasionally cleaning the lint filter with warm soapy water and a small brush. Clean inside, behind, and underneath the dryer, where lint can also build up. Take special care drying clothes stained with volatile chemicals such as gasoline, cooking oils, cleaning agents, or finishingoils and stains. Wash the clothing more than once to minimize the amount of these chemicals on the clothing, and line dryinstead of using a dryer. Avoid using liquid fabric softener on all-cotton clothing made of fleece, terry cloth, or velour. Inthe Consumer Reportsflammability tests,liquid fabric softener added to rinse water accelerated the burning speed of these fabrics. If you want a softener, use dryer sheets instead. Buy dryers that use moisture sensors rather than ordinary thermostats to end the auto-dry cycle. Thermostats can allow the dryer to run longer than necessary. Occasionally wipe the sensor with a soft cloth or cotton ball and rubbing alcohol to keep it functioning accurately. Sensorsare usually located on the inside of the dryer, just below the door opening, and can be hard to find. They are usually twocurved metallic strips, shaped somewhat like the letter "C".